“I can’t run.” That’s how I started my butterfly journey! But the friend that I prayed for and that God delivered right on time, let’s just call her “Coach”, had already prepared the Butterfly leader for my arrival and my go to line. I was unaware of their sideline conversation and fell right into place with my one-liner. When I arrived, my mind said ‘no way’, my body said ‘please’ and my emotions were safely tucked away so that I wouldn’t feel inadequate among all of these runners. I rolled off of the couch and started my fit, lifestyle change journey in October 2010 as I retreated with four women “strangers” from my church in a NC mountain cabin. This kickoff retreat was predestined to move me emotionally, spiritually, mentally and physically, and it did just that. 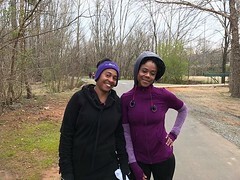 Now on the greenway for the first time with my coach’s run club, I was entering a foreign land surrounded by runner angels that supported me and my “I can’t run” mentality without hesitation. Before I knew it, I was doing a walk/run interval on the greenway the very first day with the butterfly leader shouting “Walk…Run…Walk…Run” and blowing her whistle. 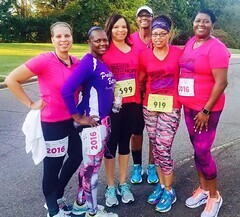 Not only was I running, I was now part of a run club that lives out its motto, Every Step, Every Mile Together. My coach was right, I could do it! 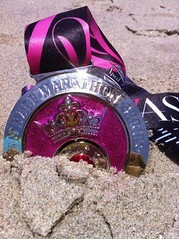 I became a believer and began to change my own mind that I was indeed a runner. Developing personal mantras to combat any contrary thoughts, I began to remind myself…”It doesn’t have to be perfect, nor does it have to be fast…it just has to be done!”, “Start…do your best…and FINISH strong!”, “I can do ALL things through Christ and that includes this.” The list goes on and on, resonating the same positive mental strokes needed to keep striking the pavement knowing that I RUN because every time my feet strike the pavement, my courage trumps my fear. 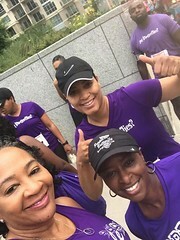 After joining the Butterflies in May 2011, I ran my first race, an 8K, in October 2011 with the finish line cheers of my new run family and the remote cheers of my coach. Feeling like I struck gold, I kept pressing to become a stronger, better, more fit and well-balanced me. That feeling continues even today, more than two years after getting off of the couch. My relentless and super-supportive coach continues to stretch me as I peel back my unhealthy layers and give new and evolving breath to my fit lifestyle. To date, I have completed not only my first 8K but also a Run Like a Diva 5K, Yiasou Greek 5K, Ramblin’ Rose Triathlon and a Runway 5K. YES, you heard correctly…I AM A TRIATHLETE! Wow! I’m building more confidence with each leg of my new, fit life and it is wonderful to re-engage my athletic side and make it a permanent fixture in my life going forward. God answers prayer so be ready to receive it when you ask for it! Not only did I leave that retreat with a closer walk with God, four new lifetime friends and a fresh life perspective; those roots branched out into a new Butterfly family, a commitment to invest in myself by promoting healthier eating and physical activity, the opportunity to encourage others to move and much, much more. This blessing was not just to turn this caterpillar into a butterfly but to bless and encourage others to do the same and pay it forward. I praise God for my given angels…I love my coach, my butterflies and my new fit self! Flutter, flutter! This entry was posted in A Butterfly Story. Bookmark the permalink.